Games! | Magic! | Space! | Time! Set against the background of multiple magical realms, this game places you in worlds where magic is commonplace and miracles occur daily. Trouble’s on the horizon though; there are disruptions across the land that are literally draining the magic from people and objects. Recruited by the Council of Magicians, you are tasked with uncovering the reason for this upset of magic across The Realms and finding its solution. You are given many tools to help you on your journey, the most powerful of which include the ability to skip through space and time. Along the way, you will interact with many personalities, engage various creatures, and ultimately learn real-world Physics in this unique Educational MMORPG. You are a stalwart Dwarv, a nimble Elv, or a versatile Hum and you specialize in the magical arts of Earth, Wind, Fire, or Water. But then again so does everyone else in the Realms! You are also a strong physical athlete and have done well in The Games in spite of this. And given that being strong and fast is not particularly important in these magical realms, you were nothing special until you were recruited by the Council. However there is something special about you and that is why the Council has entrusted you with the task of ridding the land of the Disruptures. Should you fail, all magic will fail as well and the safe future of the Realms stands in jeopardy. The story will allow for travel to various times and places in The Realms as you investigate these troubles. Each Realm is a vast and unique place full of adventure and has its own visual style and environment... differences which make a huge difference to what and whom you see! Key events will happen at specific times and places inspired by Physics history and our own story. Ultimately, the effective navigation of the currents of space and time through teleportation and time-travel will be critical as only you hold the keys to the survival of the Realms! 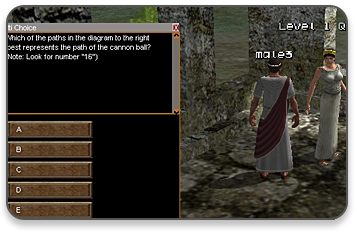 Unique combination of education and gameplay in a MMOG. Non-violent gameplay with a rich elemental spell system and engaging narrative. Hundreds of Items and Spells with several allowing you to use and abuse each world’s physical laws. Magical sports events with global leader-boards and routine championships. Each Realm is not only unique in terms of graphic, but also in terms of gravity, drag, and friction. Various unconventional themes covered including Physics, War, Xenophobia, Boredom, and more. The Four Realms are as diverse as the people that inhabit them. Each Realm has a look and feel that actually makes a difference in how the game is played. Click here to explore the geography of the Realms. With the ability to time-travel at your disposal, you’ll experience history first hand. Click here to see the timeline of events that shaped the Realms and that you will have a chance to personally experience. In this land, Magic dominates everything including death! Click here to learn more about the 5 elements that comprise our magic system and what you can do with them! Games within our game though in no way mini. These sports events are held all over and can involve magic as a component of play. Click here to see the variety of Games you can play in the Realms. This is where you will find images from our game past and present. We are constantly developing new content to come back often! Frequently Asked Questions about The Realms, it’s history, it’s people and just about anything else about the game that might be unclear. And if your question isn’t here, please email it to us! This is where you will find screenshots, free models and music, and other resource from our game. Make sure to also visit “The Pedagogy’s” Download section for more on the educational content of the game.